Candyfloss machines, carts, and stalls for hire for the fun food you'd normally only find at the fair. Our Candyfloss machines are available for hire either staffed or on a DIY basis. 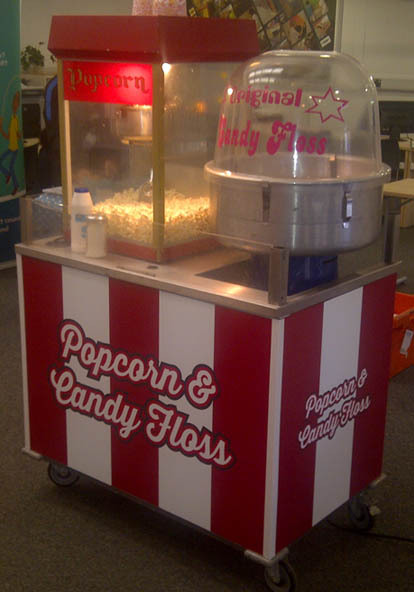 We have the Candyfloss machines available either for tabletop use, on small Candyfloss Carts, or in our themed inflatable Candyfloss stall. The Candyfloss is available in either the normal Pink Vanilla, Blue Raspberry, or Banana flavours. Other 'Fun Foods' we can provide for your event are our great new pedal powered Smoothie Bike, Popcorn machine hire and Pick and Mix stand hire. If you have any queries, questions, or would like to hire a Candy Floss machine for your event please call us on the number below or click to enquire and we will do all we can to help.